Free Team Building Activities: Download It Now! You may immediately download your Free Team Building Activities Ideas eBook by clicking here. It’s a valuable resource for active team development. Periodically, we’ll also send you the best, personally curated wisdom, on building a true high performance team. Need more activities right now? Get the Essential Team Building Activities ebook (only $2.99) with even more activities, simulations and expert facilitation tips. 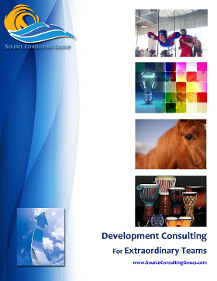 Source Consulting Group offers organizational and team development training experiences and resources, for businesses, community organizations and schools. We love what we do. Nothing energizes us more than seeing a team ignite. We get deep satisfaction from watching an organization (the people) tap full engagement and spirit. It’s our passion to see individuals energized, in every moment, expressing excellence in all they do, and watch people enthusiastically united behind a mission and a vision. This the heart of every program we deliver. Seeing your organization, school and community experience this every day…is why we do what we do. We are experts in kinesthetic (interactive) learning process; it’s the most potent way to effect behavior change. We deliver professional training in numerous industries from energy, to tech, to education, and have done so for the past 20 years. We work with off-site venues for training, and bring the simulations and kinesthetic processes directly to our clients’ locations. We guarantee our program delivery satisfaction. Build your dream team today: give us a call. We can help you transform your team: read all about it here. We build skills, not just awareness. Awareness is good; skills transform behavior. By being directly involved in the learning process, change happens, growth happens, skills are built. That's why we bring it experientially. Your people feel and experience the process, then it's effective. Experience transforms knowledge into wisdom; it’s what we live by.